Blame the European Union: U.S. Secretary of Defense Robert Gates says that if Turkey is, as he delicately puts it, moving eastward," this resulted "in no small part because it was pushed, and pushed by some in Europe refusing to give Turkey the kind of organic link to the West that Turkey sought." July 8, 2010 update: Barack Obama has endorsed this theory, as quoted in the Italian newspaper Corriere della Sera: "He discussed the risk of losing Turkey, noting that Europe's reluctance to include Ankara as a full member could push the Turkish people to 'look elsewhere'." Blame Islam: A reader of mine argues that the Atatürk revolution, now nearly ninety years old, "had all the ingredients of success (Westernization, modernity, secularism, democracy, economic growth) – and these were not imposed from without, but came organically from within. That the Atatürkist experiment is rapidly failing points to the futility of trying to modernize Islam." Center-right and center-left parties excluded from parliament had 9.5, 8.3, 7.2, 6.2 and 5.1 percent of the vote, amounting to 36.3 percent in all. Add their percentages to the CHP's 19.4 and they controlled 55.7 percent of the chamber. Had the gaggle of selfish party tyrants combined efforts, they all would have been represented in parliament and secularists would likely still be running the show. June 10, 2010 update: Readers point three other plausible explanations. The rural areas of central and eastern Anatolia had enjoyed strong growth under Atatürk and Inönü, and were primarily responsible for the rise in the Turkish population from 14 million in 1923 to 21 million by 1950. Since then, the overall population has more than tripled to 70 million, with most of the growth occurring in the rural areas or among first-generation rural migrants to the big cities. 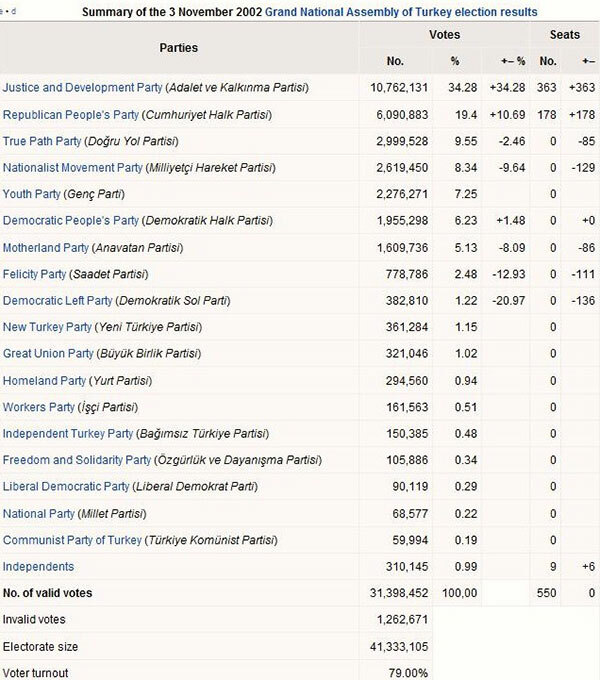 As a consequence, the political heirs of [the Anatolian-based opposition party,] the Democrats—they include Süleyman Demirel's Justice party in the 1960's and the 1970's, Turgut Özal's conservative Motherland party in the 1980's, and finally the Islamists—have enjoyed an ever-growing edge over the old CHP and its heirs. Blame Islamist money: The Saudis, Libyans, and others had been funneling money into Turkey for years. I know of no study on this topic pre-2002 (although I touched on it in a 1983 book). Michael Rubin covers this topic for after the AKP's ascent to power in "Green Money, Islamist Politics in Turkey," where he establishes a "pattern of tying Turkish domestic and foreign policy to an influx of what is called Yesil Sermaye, "green money," from wealthy Islamist businessmen and Middle Eastern states." Blame a stagnant Atatürkist ideology: Kemal Atatürk developed a powerful secular body of ideas that he rammed through in the brief period 1923-38 and which the country has ever since been absorbing. His successors repeated his formulations to the point of boredom and ennui. Plus, they made no serious effort to spread his vision outside Turkey, even to the Turkic-speaking peoples. In contrast Islamists have dynamic and exciting ideas. Jan. 9, 2011 update: For a symbol of Atatürkist statis, see the cult-like treatment of his statues as described today by Işıl Eğrikavuk in "Unaesthetic Atatürk monuments remain taboo in Turkey" in Hürriyet. Comments: (1) The demographic thesis points to larger changes in Turkish life; but Islamists are a special form of "Anatolian" and their 1/3 of the electorate in 2002 reached power only due the reasons enumerated above. (2) The financial boost from abroad existed over decades but only book off when the parliamentary rules gave it scope. (3) A dreary Atatürkist message did not pre-ordain the country to go Islamist. June 11, 2010 update: For more on the impact of Turgut Özal in the rise of the Islamists, see the informed comment by Ognyan Minchev. And a reader responds with some heat to Robert Gates' thesis that Turkish feelings were hurt by the Europeans: "Erdoğan was the beloved Prince Charming of Europe. Even of the Vatican! Europeans saw in him the model of moderate Islam with whom they can live. Only when Erdoğan began to show his true face did they begin – gradually and reluctantly and not really believing what was happening – to reject his application to join the European Union." June 26, 2010 update: Whatever the cause of Turkey's loss, official Washington is finally – about seven years late – waking to this fact. Philip Gordon, assistant secretary of state for European affairs told the Associated Press, "We think Turkey remains committed to NATO, Europe and the United States, but that needs to be demonstrated. There are people asking questions about it in a way that is new, and that in itself is a bad thing that makes it harder for the United States to support some of the things that Turkey would like to see us support."